This is a great application for the tomato sauce I made last week and really, just a great trick to have on hand for making appetizers. 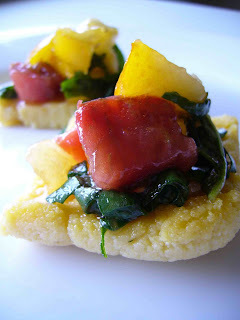 You can top these polenta squares with any savory sauce, salad or meat to make great snacks or perfect finger food for a party. Bring stock to a boil and add cornmeal in a slow, steady stream, whisking the stock all the while you add the cornmeal. Continue until all the cornmeal has been absorbed. This slow pour is worth it. If you add all of the cornmeal at once, it's a surefire way to get lumpy polenta. Once the cornmeal has been absorbed, pour mixture into a 9 x 13 baking dish and let cool. Place in the refrigerator to finish firming up. Once firm, slice polenta into 1 1/2 inch squares and add topping of your choice. Enjoy!